Take an inspiring Celtic harpist, Principal Harp with the Christchurch Symphony Orchestra, add one of NZ’s best accompanists on guitar and bouzouki and you have a stunning instrumental combination. 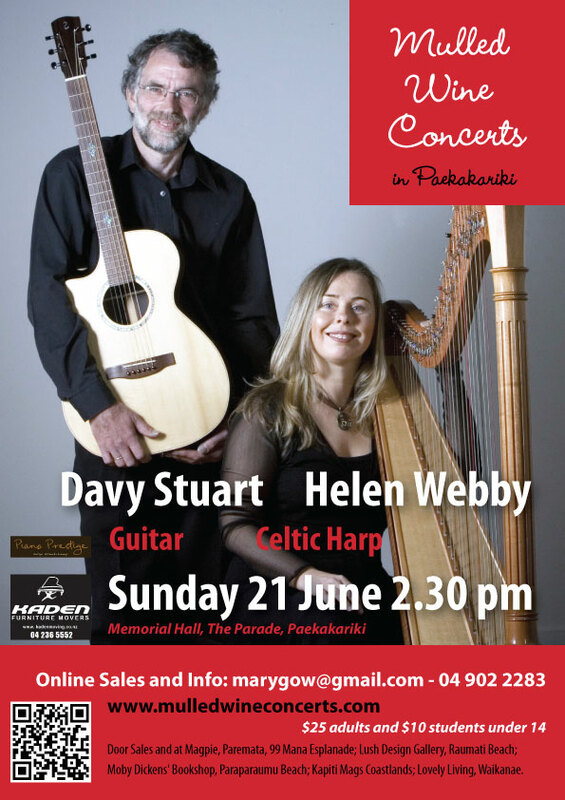 Helen Webby and Davy Stuart will play at the Paekakariki Memorial Hall at 2:30PM on 21 June, an event in The Mulled Wine Concert series which will be of interest to all lovers of Celtic music and particularly to guitarists and harpists. Equally at home in woolshed or concert hall, their repertoire ranges from the traditional music of Ireland and Scotland to new compositions from NZ and elsewhere. With an easy rapport that comes from 14 years’ playing together, they have enthralled audiences all round NZ and Australia, gathering rave reviews. Born in Whangarei, Helen Webby began playing the harp at the age of 12 and joined the Christchurch Symphony Orchestra in 2000 as Principal Harp. She also performs with other New Zealand orchestras and toured with the New Zealand Symphony Orchestra to Europe in 2010. Helen has collaborated with flautist Anthony Ferner to record the CD 'Reverie', and has released the CD 'The Golden Strand' with Davy Stuart. In February 2011 the duo released a third CD, 'Love’s Nature' with soprano Pepe Becker. Helen founded the Christchurch Harp Orchestra and is passionately spreading the magic of the harp far and wide. Davy Stuart is a luthier with a wide range of experience in Celtic music. Brought up in Edinburgh, Scotland, it seems natural that he was exposed to a wide variety of music. Playing with the pioneer Scottish band Alba saw him touring in France, Germany, Switzerland, Austria and Holland. On the demise of that band he formed a duo with the fine Scots guitarist and singer Tony Cuffe, playing fiddle, bouzouki, dulcimer and harmonium. Two years with the Scots band Crannachan followed, playing numerous clubs and festivals in Scotland, Cambridge Festival in England and Holland, in addition to various radio and TV programmes. He later joined the Scots band Rua, which based itself in New Zealand from 1989 with many club and Festival appearances around NZ and Australia. In addition to his recording and concert career, Davy specialises in the building of fine stringed instruments – guitars, mandolins, bouzoukis and harps. His international client list is extensive and growing. Tickets for the concert are available from: marygow@gmail.com and retail outlets: Magpie at Paremata; Lush Design Gallery, Raumati Beach; Moby Dickens’ Bookshop, Paraparaumu Beach; Kapiti Mags, Coastlands; Lovely Living, Waikanae. Tickets $25, students under 14, $10.